So here’s my rough plan for what I want to sew. Shorts: I’d like to do some cuffed shorts. Not too short, not too long, not too tight, not too loose. I anticipate I’ll do a fair bit of fitting on this one. I have a lovely coral twill I bought last week. 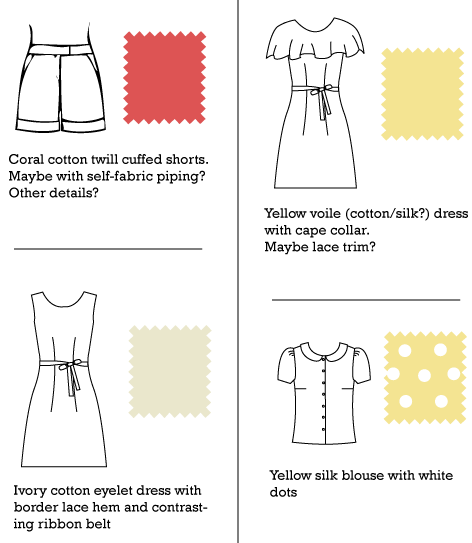 I’m planning to make these from a non-vintage commercial pattern… which I haven’t done in ages! Capelet dress: I’m hunting for a nice yellow cotton/silk voile. Or I may go with a simple yellow cotton lawn if that doesn’t work out. Something breezy for warm weather. Eyelet dress: I have a gorgeous eyelet on hand for this one, with a lovely border I’ll use for the hem. Blouse: A simple and pretty peter pan collar blouse in yellow silk shirting with white dots. I feel that I still need to dream up some little details here and there, but these are my basic concepts. Have you decided on anything particular to sew? You can share it in the forum, even if it’s just a list. Whatever helps you plan! Spring Palette Challenge Week Four! Spring Palette Challenge Week Five! this reminds me…to bring in that shorts pattern! it’s vintage, but maybe it’ll work!